On 26th June, thousands of people across 205 cities in 93 countries took part in the fifth global day of action for the Support Don't Punish campaign to call for an end to the war on drugs. Four years ago, I wrote a blog about the "growing momentum for drug policy reform", after the first ever 'Global Day of Action' had taken place - with 41 cities holding events. This year, the global movement for drug policy reform got even bigger! There were concerts, large public protests, seminars, radio shows, street art, sports matches and meetings with policy makers. The actions were imaginative, innovative, diverse and vibrant. In the UK, students from the University of East London ran an information stand outside of a busy shopping centre to inform the public about harmful drug policies and the "Rat Park" experiments of the 1970s. In India, colleagues embarked on a 470-kilometre motorcycle outreach tour with public interactions and photoshoots along the Delhi-Rajasthan highway. In Paris, drug users opened a mock "drug store". In Mauritius, there was a silent protest in front of Parliament, and meetings with religious leaders. In some cities, a handful of people gathered, taking photos and sharing the Support Don't Punish message. The Global Commission on Drug Policy joined the campaign this year, adding their political weight to the campaign's message. People from all four corners of the globe came out in their droves to join the ever-growing community that Support Don't Punish has now become. So, what does all this achieve? There may be a long way to go until we can really say that the war on drugs has ended - but days like this show that the momentum is on our side. To have people taking to the streets on this scale for an issue like reforming drug policy would have been unthinkable ten years ago. Support Don't Punish has managed to capture and feed an appetite for action - whether through organising an event, turning up on the day, or even tweeting a photo. The 26th June - despite being the UN's official day against drugs - was once again turned into 'Support. 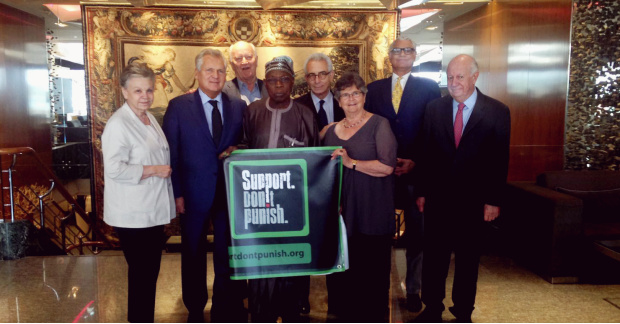 Don't Punish Day', a global show of force for social justice, for human rights and for fairer drug laws. Commissioners Maria Cattaui, Alexander Kwasniewski, Thorvald Stoltenberg, Olusegun Obasanjo, Ernesto Zedillo, Ruth Dreifuss, Anand Grover, and Ricardo Lagos. Global Commission on Drug Policy.